Reflections of a Newsosaur: Why not use research to edit the paper? Despite the recent uproar at the Chicago Tribune over road-testing stories with consumers prior to publication, there is nothing wrong with editors using market research to shape their publications. More of them should do it. And it’s pretty easy, too, as I’ll discuss in a moment. Well-executed research is a valuable tool for the managers of any consumer-oriented business. The long-running plunge in newspaper circulation is proof that the industry is not pleasing enough of its intended customers. Thoughtful research, thoughtfully applied, could help the industry arrest the decline by becoming more customer-driven. Journalists at the Tribune were properly up in arms last week when they learned the marketing department was asking consumers what they thought of specific stories potentially destined for upcoming editions of the newspaper. Emailing summaries of upcoming news stories to 9,000 people seems particularly inadvisable in a competitive news town like Chicago, where the Sun-Times, Huffington Post-Chicago, ESPN Chicago and several enterprising broadcast outlets would be only too happy to spoil any pending Trib scoop. The inelegant execution of the Trib project should not be taken as an argument against the value of blending consumer sentiment with sound journalistic judgment in editing a newspaper or website. While editors would not have the time or money to conduct formal polling to determine reader preferences on a day-to-day basis, they can get instant, ongoing snapshots of consumer sentiment by monitoring the traffic on their websites and local Twitter feeds. The editor of a distinguished newspaper in South America told me that he posts stories to his website as soon as they clear the editing process. He watches website activity through the evening and takes the relative interest in each story into account when he lays out the print product at 10 p.m. This is not to say editors should yield their professional responsibility or news judgment to a stream of meandering tweets. But taking advantage of the rich empirical data available to modern editors beats the decidedly unscientific research I conducted when I ran the city desk of the Sun-Times in the early 1980s. While schlepping to the office on the bus and the L, used to peek over the shoulders of fellow commuters to see which stories they were reading. Although I occasionally gleaned some useful information, I also got a lot of dirty looks. The problem is that the people who most need to be researched are the ones who don't read the paper or click on its website. "While editors would not have the time or money to conduct formal polling to determine reader preferences on a day-to-day basis, they can get instant, ongoing snapshots of consumer sentiment by monitoring the traffic on their websites and local Twitter feeds." I'm sorry, but this is not market research at all. What you are describing here is a decision-making process based on a self-selected set of data. This process in no way reflects preferences or desires of the market as a whole. An automobile dealership offering consumers 97 models, "all in pink," will never, ever sell a vehicle to a consumer who wants to purchase a white car. It is clear from the tens of thousands of reader defections during the past decade that newspaper content is, in many large and important ways, missing the mark for the vast majority of the population. Editors need to look beyond the few who still manage to read newspapers and explore what content is considered "missing" from those who left and those who don't / never read. Real "market" research attempts to answer those questions based on the preferences and desires of the entire "market," not just the 20% - 30% who still read daily newspapers. Sadly real market and editorial research budgets were among the first "savings" publishers could find with their cost-cutting axes. Their rationalization paralleled comments made in your thread. In the web-era, all the "research" they needed was actually free and could easily be obtained by looking at web logs or through self-selected reader panels. It's another prime example of short-term thinking that's certainly come back to haunt them today. I will agree with both Alan's basic premise, and 8:07 AM's response, except for the implication that research specific to the newspaper audience is no longer valuable or necessary. 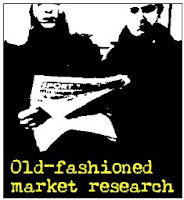 Other media have long used audience research to shape and guide editorial content. Newspapers, in fact, are the only major news/entertainment medium in the country in which this is not the case. Unfortunately, as the prior poster notes, the industry's myopic budgetary focus -- and, I will add, editorial arrogance -- are assuring that most publishers continue with relatively little knowledge of their customers. Do we really need to ask why the industry is in trouble? If you did this type of research in my market research class, then you would flunk. At best, you have an exploratory research design. As any junior or senior who has completed my market research class can tell you, you never make a managerial decision based on exploratory research. Exploratory research should guide the research as they develop either a descriptive and/or causal research design. The notion that twit feeds and web site polls can be used to solve managerial decisions represents further abuse and misuse of research. How many newspaper redesigns were hailed as the next big thing because of a focus group? How many newspaper redesigns reflect attitudes and opinions uncovered through mail and/or internet surveys? Yup, I would go with ALL and NONE. Why did I stop reading local papers and newscasts? The product became lousy. End of story. Blaming lack of market research is too easy. To be clear, reported morning newspaper circulation peaked in 2004. We know the decline started a bit earlier, and that the reported numbers were fraudulent, but the decline in morning circ was almost certainly due to cutbacks in marketing. It was the long-term decline of evening circulation that drove overall circulation downward. The advent of the Web did not change the slope of the curve one iota. This decline was obviously due mainly to suburbanization. Market SHARE is another matter. Of course newspaper editors -- and publishers -- should have been doing market research to figure out what NON-READERS wanted, in print and online. It almost certainly was not a diet of warmed-over, syndicated entertainment and culture stories devoid of local angles! The Trib is missing the mark... again. You NEVER, EVER, NEVER, NEVER, NEVENER, NEVEREN, EVERN, NEVER EVER use research this way. We have market researchers in my family and this is THE CARDINAL RULE. YOU NEVER DO THIS. This is what makes market researchers shudder and cringe. You use market research to decide where best to place ads - fine. You use it to see whether a message is getting through. Fine. You don't use it to decide which songs to play on the radio OR WHAT STORIES TO RUN OR HOW TO RUN THEM. This is a big problem in market research - the client has paid for it and wants to use it however they like. Which is why private ownership of the news is a huge problem. in india, we have been using market research with good effect for a long time. obviously - these are 'qualitative' research rather than 'quantitative'. another method, which seems to work pretty well is to have reader 'panels' to get periodic feedback say every fortnight or a month. the key, of course, is how to define the 'universe' from which to draw the respondents. this is done in 2 ways - one thru' direct 1-on-1 MR interviews and second is to apppoint trained 'implants' who draw informal feedback thru their social and professional circles. the data gathered are then discussed and acted upon in conjunction between editorial and marketing (management). i have done it both for new launches and existing products with equal benefits. It is worth noting that the Geelong Advertiser in Australia ran a promotion where readers were allowed to vote the front page of the paper online from four options. Bevo, you're confounding the broader idea of using research with the limitations of the example(s) offered by Alan (which is why I agreed with his basic premise and not his specifics). Do you think the producers of those "local papers and newscasts" knew that their products had crossed your threshold of minimum acceptability? I'd say probably not; that it was more a case of weakening product quality as a result of ongoing attempts to cost-save their way to profits. How would they have known that they'd gone too far, what needed improvement, or what they could prioritize for further tuning? Yup, research. The qualitative information that Alan advocates using -- if not his suggested techniques -- is necessary but insufficient for the hypothetical decisions to be made, and that's where most newspapers get into trouble: They adopt a course of action or methodology dictated by budget rather than by information needs. Too few understand the idea that "bad research is worse than no research at all." I really don't see the fuss about this. Obviously, someone was curious what the public reaction would be to stories before they had a chance to see them or know about them in the paper. Sounds like a sloppy experiment to me, but it might provide some insight into readership interest. God knows, I hear an awful lot about how boring newspapers are. Maybe this sort of research would find the spark that would enliven them. i work for a newspaper co and i can tell you that as a general rule, the most clicked on stories involve either a) bikini girls, b) horrific car crashes, c) cute animals, or d) a combination of all. this does not make good journalism. in australia, a free newspaper was recently launched by News Corparation that basically combines all of the above, and every single day, the peak-hour commuter trains are filled with office workers reading this paper, much to the quiet disgust of myself. if market research is telling us that's what readers truly want, then i think the problems of humanity just got worse.